This presentation tries to give a gentle introduction to deep learning, proceeding from theoretical foundations to applications. We first discuss general reasons for the popularity of deep learning, including several major breakthroughs in computer science. Next, we start reviewing the fundamental basics of the perceptron and neural networks, along with some fundamental theory that is often omitted. Doing so allows us to understand the reasons for the rise of deep learning in many application domains. Medical image processing and digital humanities are examples of areas which have been largely affected by this rapid progress. Mostly perceptual tasks have benefitted from this, as we show in our examples. However, there are also recent trends in physical simulation, modelling, and reconstruction that have led to astonishing results. Yet, some of these approaches neglect prior knowledge and hence bear the risk of producing implausible results. These apparent weaknesses highlight current limitations of deep learning. However, we also briefly discuss promising approaches that might be able to resolve these problems in the future. 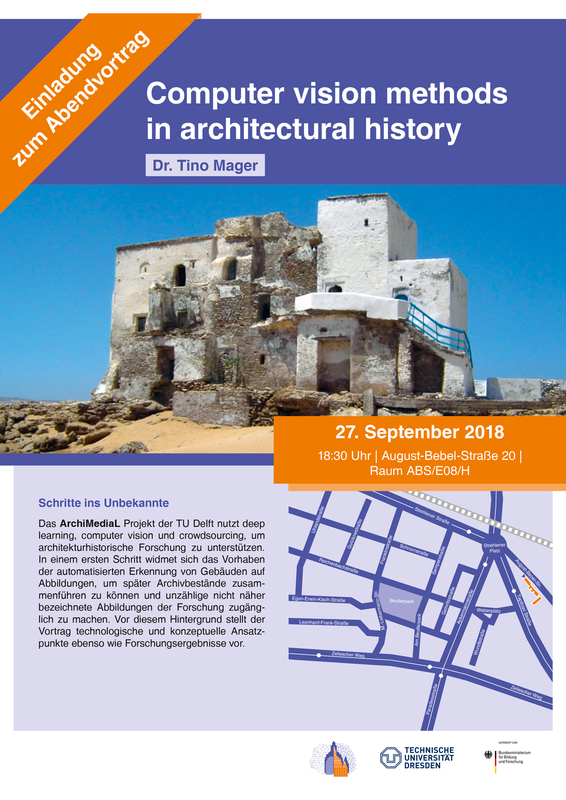 This lecture is organized by DRESDEN-concept e.V., working group Digital Humanities Dresden and the Junior Research Group UrbanHistory4D. 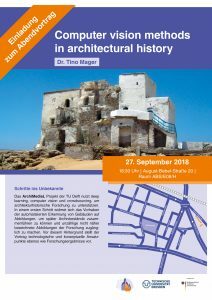 The ArchiMediaL project of the TU Delft uses deep learning, computer vision and crowdsourcing, in order to investigate historical architecture. In a first step the project is dedicated to the automated recognition of buildings on the basis of illustrations. Against this background the lecture presents technological and conceptual starting points as well as preliminary research results. 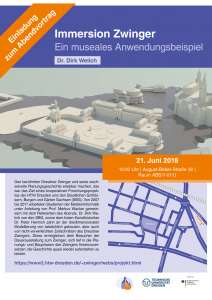 To bring the famous Dresden Zwinger and its varied planning history to life was the aim of a cooperative research project of the HTW Dresden and the Staatliche Schloesser, Burgen und Gaerten Sachsen (State Castles, Saxon Castles and Gardens - SBG). From 2007 to 2011, students of Media Informatics under the supervision of Prof. Markus Wacker worked together with the evening's lecturer, Dr. Dirk Welich of the SBG, as well as the free art historian Dr. Peter Heinrich Jahn on the three-dimensional modeling of actually built, but also unrealized temporal stratas of the Dresden Zwinger. 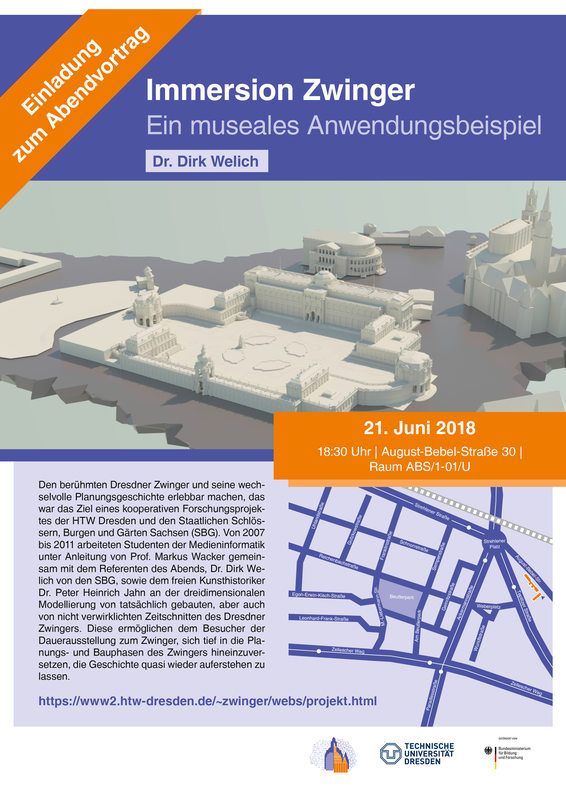 These enable the visitors of the permanent exhibition to immerse themselves deeply into the planning and construction phases of the Dresden Zwinger, to virtually revive the story. Digitale Bildrepositorien. Wirkliche Arbeitserleichterung oder noch verbesserungswürdig? Diese Erfahrung teilen sicher viele: Bei der Suche nach einer bestimmten Abbildung, zum Beispiel nach einem Foto eines Gebäudes, konsultiert man verschiedene Online-Plattformen, doch entweder werden gar keine Treffer ausgegeben oder aber man erhält eine unüberschaubare Flut an Ergebnissen, die leider oftmals nicht relevant für das eigene Suchanliegen sind. 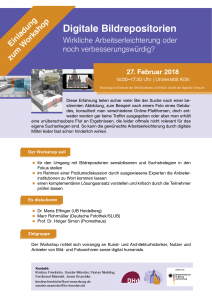 So kann die gewünschte Arbeitserleichterung durch digitale Mittel leider fast schon hinderlich wirken. 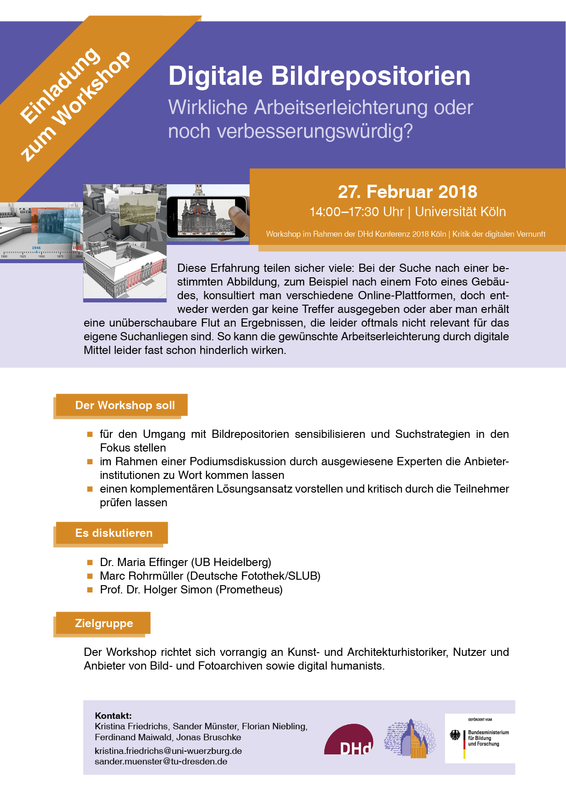 Der Workshop richtet sich vorrangig an Kunst- und Architekturhistoriker, Nutzer und Anbieter von Bild- und Fotoarchiven sowie digital humanists.